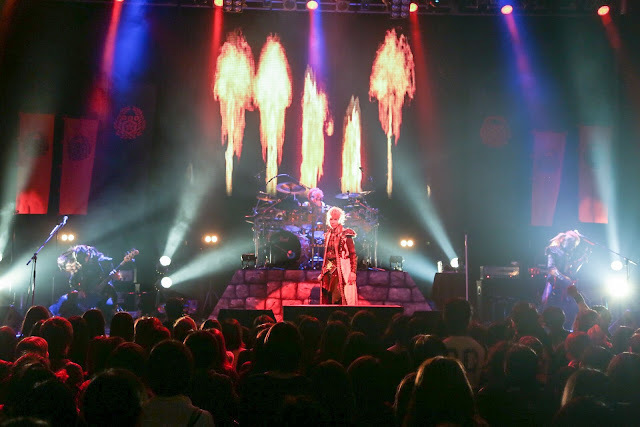 LIVE REPORT: Sengoku Jidai (戦国時代) - The age of civil wars - @ TSUTAYA O-East | VKH Press – J-Rock & Visual Kei Coverage Worldwide! Concertgoers were transported to the era of feudal Japan and the reign of warlords at the first concert of Sengoku Jidai - The age of civil wars -. Despite being a new band, the members were all powerhouse veterans of the genre. Beginning with main vocalist Noa-A (formerly YUKI of JURASSIC), guitarist and support vocalist Kz (formerly KAZUMA of SIAM SHADE), bassist Date (currently playing for VAMPS, Derailers, and other acts) and drummer S.N.D (formerly JUNJI of SIAM SHADE and a support member for Acid Black Cherry and other acts). With such a stellar cast, the live house was filled with eager fans waiting for the show to start. What's unique about this group is that up until recently, the identity of the members had been a closely guarded secret. The only available visuals were beautifully drawn anime-style illustrations done by some popular illustrators. Keeping true to that theme, the show opened with the screen at the back of the stage lighting up, showing an illustration of a blue-haired character dressed in Sengoku Jidai clothing named MANZO. He was the MC for the night and he welcomed the crowd to the show. He asked them to call out for the members who were just making their way off the battlefield. The band came out all at once, impressive in their period-style regalia. The stage was decorated with war banners and an elevated drum stand that looked like the walls of a fort. They took their places and the show began. They performed "戦友 (Senyuu)", "戦国時代 - The age of civil wars- (Sengoku Jidai - The age of civil wars - )", and "常翔 (Josho)" in succession which got the crowd immediately participating, pumping their fists in time to the music. The members were skillfully moving around the stage and Throughout the songs, the screen showed various animations of landscapes and scenery of the Sengoku Jidai. They paused after and the crowd was screaming and cheering. Nao-A welcomed everyone to the battlefield and got the crowd raring to go again with a round of screaming calls and responses. Deep pink and purple lights lit up the stage for the next song, "SAKURA" and the accompanying music video played on the screen throughout. Date and Kz were crouched near to each other, rocking out and the crowd matched their energy, headbanging with abandon until the end of the song.The band brought down the tempo for "夢の果て (Yume no Hate)" and the change in pace really brought out the richness of the instrumentals and the unique tones of Nao-A's voice. 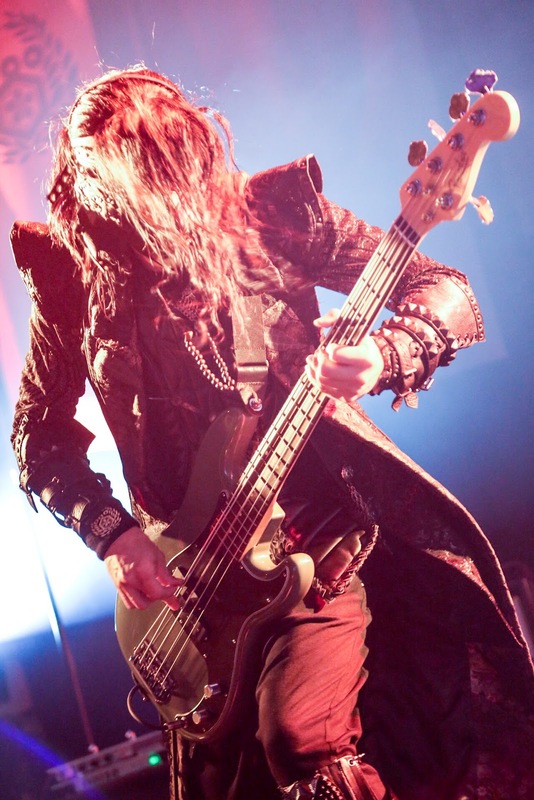 The crowd listened attentively and then the focus shifted at the end of the song when most of the members left the stage leaving Kz with the crowd.Using a loop pedal, he crafted an upbeat melody that had the crowd clapping and grooving as he played increasingly complicated riffs and scales on top of it, showing off his impressive skills. The rest of the members returned and they performed "道化師 (Doukeshi)" one of their latest releases, much to the excitement of the crowd who responded enthusiastically, increasing the energy of the band. After that, Nao-A introduced the members, pointing out all their new aliases and getting the crowd to scream their names one by one. Next up was "戦場 (Senjo)" their newest song which was made even more dramatic by the accompanying video of fallen war banners on a battlefield. "いざ参れ (Izamaire)" was an extremely fun performance with intense riffs and deep red lights to match. 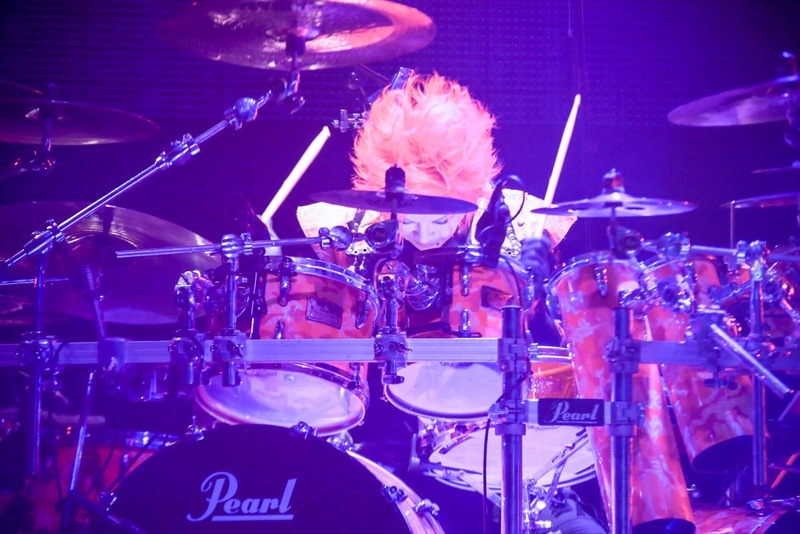 The beat had a strong bass and drum line and the members all bumped along to the beat. Blasts of fog covered the stage and when it cleared, Date was standing on the platform at the center of the stage with only S.N.D remaining. S.N.D began to play and Date crouched low and began to play. He got the crowd riled up as he moved around the stage showing off his skills. 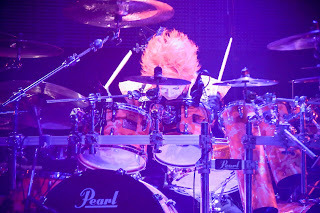 Then the spotlight switched to S.N.D who went all out on the drums as the crowd screamed his name. 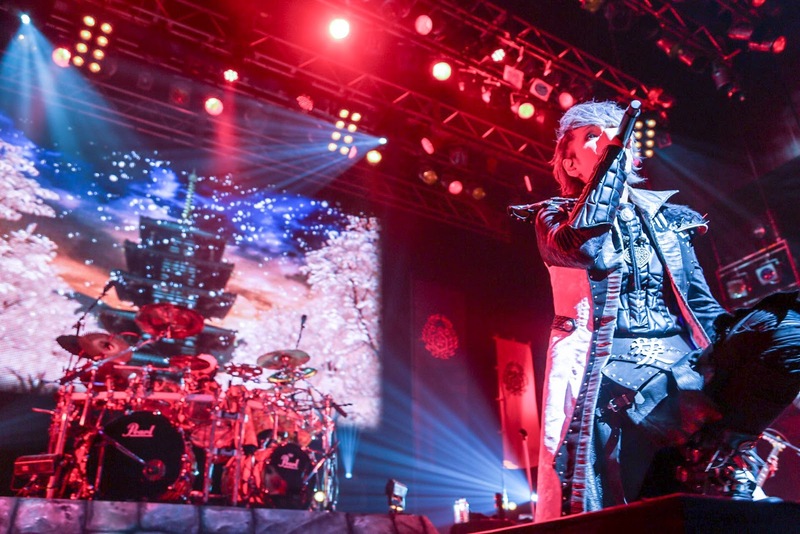 Without lowering the energy, the two of them immediately began the next song, "Dancing Samurai Soul" as the rest of the members returned to the stage. Nao-A was holding a fan and the audience also pulled out paper fans and everyone began waving to the music. From there, they continued with nonstop energy until the final song "愛染明王 (Aizen Myouou)", an extremely fun song where everyone frantically waved towels and danced to their heart's content. The members let loose and were joking around with each other as they continued to play. The band left the stage and as soon as it emptied, MANZO reappeared. He thanked the crowd for their participation and gave the band well-deserved praise saying, "Just what you'd expect from veterans.” He told the crowd the story of how the members formed the band then at his prompt, everyone began screaming for an encore. The band didn't wait long to return and immediately began again with "狂歌乱舞 (Kyoka Ranbu)" another upbeat song with harsh riffs and intense drums. "How was it? Was it fun?" Nao-A asked the crowd, who responded with even more cheers and screams. "It's so fun, I surprised myself!" He told the crowd that the band was formed around the concept of 4 guys who just love music more than anything and asked if they would keep coming to see them. With a new single and more activities planned for the new year, the fans have a lot to look forward to. The next and final song, "輪廻の華 (Rinne no Hana)" encompassed all the band's feelings towards their fans and supporters and when it was over, they thanked the crowd again and held hands for a final jump. It was a great start to an already impressive band and needless to say, it's exciting to see what they do next.